The final free concert is on Saturday July 8 at 3:00pm in Concordia Chapel. Solos, and large group performances by students and faculty. All welcome. 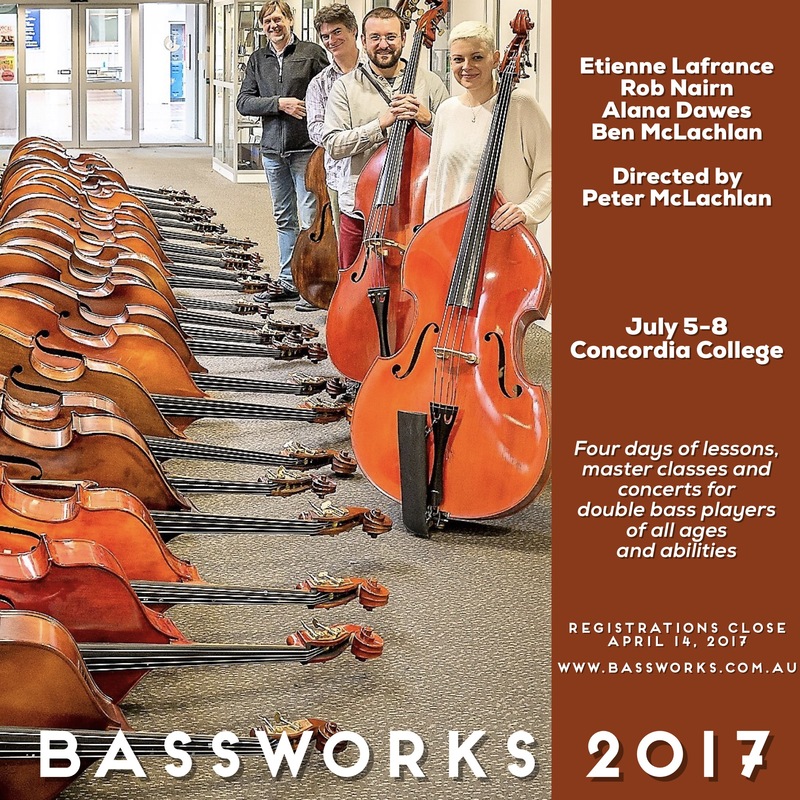 The Workshop – 4 days of lessons, masterclasses and concerts for double bass players of all ages and abilities. Repertoire from The Developing Bass Player, Francois Rabbath Volumes and George Vance Volumes. Etienne LaFrance is a regular faculty member from Quebec, Canada, bringing an intimate understanding of the Rabbath technique to the Workshop. He is a very humble double bass virtuoso who loves to perform and share his knowledge and technique. He is also a new Dad for the second time around! Welcome to little Arthur LaFrance! Rob Nairn must be the double bassist with the most frequent flyer points. Every time I see his name, he is in a different country. He is Professor of Bass at Julliard and Penn State University and will bring his vast knowledge, virtuosic skills and warm personality to our workshop again this year. Alana Dawes is Adelaide’s busiest bass teacher. With over 50 students she packs her week of teaching and performing very full. A regular faculty member for the last 2 years, she brings her enthusiasm and love for all things bass. Ben McLachlan – Winner of the silver medal for tone at the International Society of Bassists, Bass Making competition in 2015 at Colorado, USA. Ben will be at the workshop doing setups, bow rehairs and adjustments. It is also an excellent time to try out his Adelaide-made bows and basses. Peter McLachlan began the Adelaide Bass Workshops in 1990. In his passion for teaching the Double Bass, he endeavours to enrich the playing lives of students and teachers alike. Generations of bass players have been enthused for the last 27 years by the 4-day event.